So maybe text marketing just isn’t your cup of tea. 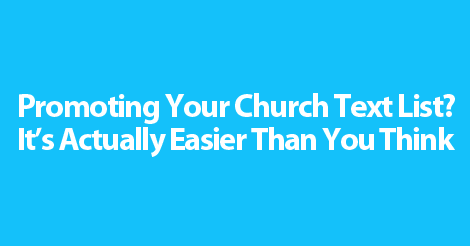 Instead, your church simply wants to fire out general announcements to congregation members. Guess what? That’s totally doable. Our church texting service offers diverse solutions for all businesses and organizations. Ready to get started? Here’s a few list promotion ideas. 1. Display on your service powerpoint. Tons of large churches take advantage of powerpoint presentations or projectors. Add opt in details to your opening slide. Follow up with a verbal cue. This really solidifies the chance of opt in. 2. Print signup details in the bulletin. Chances are, your congregations members will take the bulletin home with them, and comb through it during the week. Print up opt in details on the first or second page of your church bulletin. Most churches run through a list of welcome announcements during the first five minutes of the service. This is a great time to tout your text communication program. Ask your speaker to mention this new mobile communication tool, and give examples of how it will benefit each individual. Remember, keep all communication extremely relevant. When it comes to text communication for churches, segmentation is ideal. If you create a few different subgroups, such as youth, board members, and men’s small group attendees, your messages will be much more relevant and qualified. Similar to text marketing, if you’re not promoting your text communication list, it simply won’t grow. Remember, keep all opt in details short and sweet. Get right to the point. Don’t clutter your promotional materials with an overuse of images or text, as this will do nothing for your list growth. 2016 is the year of text communication. Partner up with top church text messaging provider, SlickText.com. Give us a call at 1.800.688.6290 to learn more, or head over to the pricing page and sign up for a free plan. Our educational resources and featured loaded platform empower even the newest text communication user to succeed.